What Is Coil and Can Coating? Coil and can coating is an organic material that’s applied on rolled metal strip in a continuous process which includes cleaning (if necessary) and chemical pre-treatment of the metal surface. It also includes either one-sided or two-sided, single or multiple application of (liquid) paints or coating powders, which are subsequently cured and/or laminated with permanent plastic films, cleaning, chemical pretreatment, primer coat application, curing, final coat application, second curing, exit accumulator, and recoilers. *Note: from step 6 on, materials touching the surface will make a difference in each step. Post-coating was costly, time-consuming, and environmentally harmful. Formed parts can have many holes, recessed areas, valleys, and hidden areas that make them difficult to clean and uniformly paint. Manufacturers produce and ship 4.5 million tons of coil-coated steel and aluminum in North America each year, with an additional 5 million tons produced and shipped in Europe.. 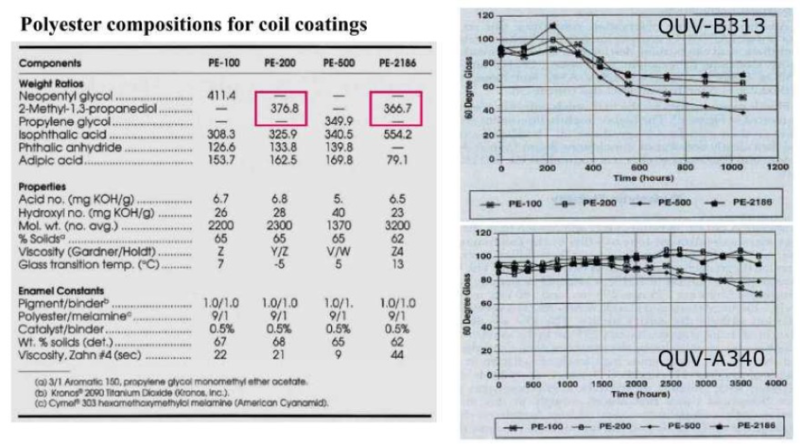 In almost every five-year period since the early 1980s, the growth rate of coil-coated metal has exceeded the growth rates of steel and/or aluminum production. Where Is Can and Coil-Coated Material Used? Pre-painted metal is used in a variety of products. It can be formed for many different applications, including those with T bends, without loss of coating quality. Major industries use pre-painted metal in products such as building panels, metal roofs, wall panels, garage doors, office furniture (desks, cubicle divider panels, file cabinets, and modular cabinets), home appliances (refrigerators, dishwashers, freezers, range hoods, microwave ovens, and washers and dryers), heating and air-conditioning outer panels and ductwork, commercial appliances, vending machines, foodservice equipment and cooking tins, beverage cans, and automotive panels ,and parts (fuel tanks, body panels, bumpers). The list continues to grow, with new industries making the switch from post-painted to pre-painted processes each year. Some high-tech, complex coatings are applied with the coil coating process. Coatings for cool metal roofing materials, smog-eating building panels, antimicrobial products, anti-corrosive metal parts, and solar panels use this process. Pretreatments and coatings can be applied with the coil coating process in very precise, thin, uniform layers, and makes some complex coatings feasible and more cost-effective. The largest market for pre-painted metal is in both commercial and residential construction. Many choose pre-painted metal for its quality, low cost, design flexibility, and environmentally beneficial properties. A wide range of color options are available with pre-painted metal, including vibrant colors for modern designs, and natural, weathered finishes in rustic expressions. Pre-painted metal also can be formed, almost like plastic, in fluid shapes. This flexibility allows architects to achieve unique, expressive designs using metal. What Is Used in Can and Coil Coatings? A number of chemicals are used in can and coal coatings, including polyesters, plastisols, polyurethanes, polyvinylidene fluorides (PVDF), epoxies, primers, backing coats and laminate films. For each product, the coating is built up in a number of layers. Primer coatings form the essential link between the pretreatment and the finish coating. The composition of the primer will vary depending on the type of finish coat used. Primers require compatibility with various pretreatments and top coat paint systems; therefore, they usually comprise a mixture of resin systems to achieve this end. Backing coats are applied to the underside of the strip, with or without a primer. The coating is generally not as thick as the finish coating used for exterior applications. Backing coats are generally not exposed to corrosive environments and not visible in the end application. Several polyester formulations appear in patent US6413648 to show a general synthesis of polyesters used in can and coil coating. Polyesters with specific physical properties and Tgs are used in can and coil coatings; formulators usually deploy a blend of multiple polyesters (at least two), one with higher Tg and one with lower Tg. Neopentyl glycol (NPG) is widely used in these formulations to offer flexibility, humidity resistance, UV resistance, low Tg, and liquidity that’s easy to handle. The list below compares the physical properties of diol monomers that are commonly used in the synthesis of polyester polyols. This list illustrates how easy the diol can be handled and how easy the reaction of polyesterification can be controlled. 2-methyl-1,3-propanediol (MPO) is recognized as a better alternative for NPG not only in price, but also since it offers more convenience than NPG in storage, reaction, transportation, etc. (+ is good, - is bad, / is no data). 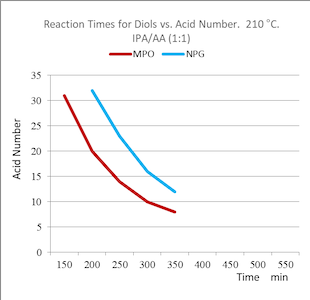 The following charts illustrate the difference between MPO and NPG with regard to hydrolysis resistance and reactivity in polyester formation. In both cases, MPO performs better. In the chart below, we compared gloss retention performance among four formulations, based on four different polyesters. The results show consistently good performance with MPO-based polyester formulations. In fact, the MPO-based polyester formations are better than their NPG-based counterparts and much superior to PG-based polyesters. The can and coil coating process is quite advanced, providing the industry with metal sheeting that performs much better than sheeting produced by traditional manufacturing methods. The key component in coating should give the metal sheet the same durability and processability as the underlying metal itself. 2-Methyl-1,3-Propanediol (MPO) brings to the mix low viscosity, high amorphocity, high reactivity, and high compatibility, benefitting manufacturers both in process handling and finishing products for can and coil coating. During the process, MPO is beneficial due to its low viscosity, stability with regard to oxidation, and the fact that it’s easy to level to produce a thin layer film, while improving compatibility in the system (no fish eyes), offering fast reaction, having a low melting point, and staying in liquid form at room temperature. In final products, MPO delivers high clarity to guarantee the right coloring, high adhesion, flexibility (pliability), wear resistance, high temperature resistance, low Tg, bending without becoming brittle or cracking, a wide range of elastomeric properties, abrasion resistance, UV light resistance, and great compatibility with other polymers and solvents. As a result, metal sheets coated with the MPO modified coatings can endure the same processing procedure as the base metal itself: folding, grinding, pounding, cutting, layer separation, baking, and high vibration. Gantrade has more technical data to share on MPO usage in Can and Coil coating applications. Please contact the sales and technical team at Gantrade to learn how MPO’s use can optimize your processes and products for greater efficiency in production and higher performance in the marketplace.